There is nothing more satisfying than sitting down to a meal where one or more of the ingredients have been produced from your own garden or allotment. As soon as dinner is served, every moment of hard work and effort that goes into growing your own is immediately rewarded. Once your freezer and store room are full, why not get out your recipe books and try a new dish? It’s surprisingly easy to create a fruitful harvest, even if space in your garden is at a premium. Many vegetables, fruits and herbs can also be grown in containers or in pots on windowsills which offers a great way to get started with grow your own. Here are a few tips to help you make the most of your produce and hopefully keep ‘gluts’ (excess produce) to a minimum. Taking time to plan what you’re aiming to produce for the coming year is important. Research seed and plant varieties to make sure that they’re suitable for the soil type and district of your garden or allotment. Find out what your family enjoy! There’s very little point in growing large numbers of crops that no-one is going to eat, but part of the fun of growing your own is trying new things - so don’t limit yourself too much. Plan to have at least one crop available for harvesting throughout the year. Including an area for Brassicas such as sprouting broccoli and kale or leeks, swede and parsnips means you’ll have crops available throughout the winter and in early spring, when there are fewer vegetables available. Quick maturing crops such as salad leaves, herbs and radishes should be sown in short rows every couple of weeks to avoid a glut but ensure continuity. Brassica plants are best sown in ‘modules’ or individual pots and grown on until they are large enough to be planted out when the ground for winter crops becomes vacant. 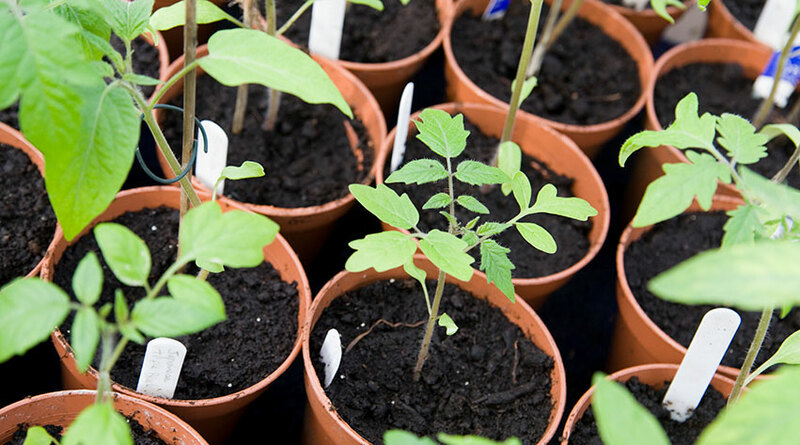 Many other varieties can be sown in pots and planted out once established including peas, beans and loose leaved lettuce early in the season, when it may be advantageous to use plants rather than sow seeds directly into cold, wet ground. If the weather is wet and cold early in the season, cloches can be used to warm the soil and protect early sowings to achieve an earlier crop. Vegetables and fruit that will not store for long once they are harvested should be picked little and often, then used immediately, frozen or preserved for future use where possible. Parsnips, leeks and early potatoes can be left in the ground and dug when they are required. Beetroot, carrots, onions and second early and main crop potatoes can be used from the ground, while any excess crops can be lifted in autumn before adverse weather, stored and used throughout the winter and colder months. These crops will not store for long and should be kept in a refrigerator once picked. Start to harvest young, individual leaves. Pull up lettuce plants and store in the fridge with the root still intact, wrapped in wet paper towels and sealed in a polythene bag. This will prolong the life of the plant. Alternatively, pick and wash salad leaves and herbs such as parsley, chervil and coriander. Store them in a plastic container in the ‘fridge with wet paper towels in the base of the container where they will stay fresh for longer. Herbs, such as chives and parsley can be chopped and frozen in ice cube containers with water added. Once the cubes have frozen, they can be bagged up and used in soups and stews. Some, such as rosemary and mint can be preserved as jelly. Many, such as bay leaves can be dried. Remember, herbs can be grown in window boxes too! These can be left in the ground and dug as required for use. New potatoes are best stored in the fridge once they have been dug. ‘Second Earlies’ and maincrop varieties can be dug and stored towards the end of the summer for future use. Choose a dry day and brush off as much soil as possible but do not wash the tubers. Store in cardboard boxes in a cool, dark place such as a frost free garage. Potatoes are great for growing in a small space - particularly early potatoes. These can be left in the ground and pulled for use as required. Many will also freeze if blanched in water or can be lifted and stored in sand boxes in a cold shed or in a ‘clamp’ outside through the winter months. These include beetroot, carrots, parsnips and swede. Early carrots are great to grow with limited space - especially the Nante or round Paris Market varieties as these are particularly small. These should be picked regularly and used immediately or frozen. Peas and Broad beans can be shelled and frozen on trays before being bagged up. French and Runner beans can be blanched or sliced and frozen on trays before bagging. The latter also make delicious chutneys and pickles! Some squashes such as Pumpkins and ‘Turks Turban’ will store for many months once the skins have been ripened by the sun, without any assistance. Softer squashes such as courgettes and ‘Patty Pan’ should be picked often and used as ‘baby veg’ to avoid being overrun! Because of their high water content, squashes do not freeze well but can be frozen as soups and purees or preserved by pickling or making into chutneys. These should be harvested as the top growth begins to die off and allowed to dry completely before storing in boxes or for onions, as ropes in a cool dry place. Garlic can be stored in the same way or used fresh from the ground. Spring onions will not store for long and should be treated as salad crops. Shallots are great space savers - just one immature bulb planted in the soil will develop into five or six shallots, so we’d recommend these if there’s limited room in your garden. Amongst the hardiest of vegetables, many of these will stand through the winter and can be picked as required. Most can also be blanched or made into soups and purees, then frozen. Summer cabbage and spring greens should be stored in the refrigerator. Top Fruit includes apples, pears, cherries and plums. Some apples and pears will store for longer than others in a cool, dry place in boxes. Cherries and plums will not keep for long and should be preserved or frozen if they are not used immediately. This includes currants, gooseberries, blueberries, strawberries and raspberries. Soft fruit has a very limited life in the refrigerator and should be used within a few days of picking. Any excess should be preserved or frozen for future use. We recommend rustling up a delicious jam if you aren’t going to eat these fresh.